This page is for gifts of $25 and under. Select the item and through Paypal you can make a contribution to our cause that will allow us to purchase the specified item. A PayPal account is not required. 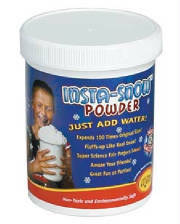 An amazing powder that turns ordinary water into a white fluffy substance that looks like real snow. Non-hazardous and environmentally safe, with great science projects included in the activity guide. These tubes are tuned to different musical notes. Children play notes by whacking the tubes on different surfaces such as a table, chair, or the floor. Great for energetic and creative expression. Provides sensory, auditory, tactile, and and visual stimulation for kids. Colorful and pre-tuned to ensure a high quality and clear tone. With small beads inside, each bounce creates a pleasant spinning rattle sound. Great for tactile, visual and auditory stimulation. One touch is all it takes to understand why kids have a ball with the easy to grip Fun Gripper Flyer. The patented non-slip surface makes grasping, throwing, tossing and catching easy and secure for even the smallest hands. Adds confidence for sensory and gross motor development.